White Carrara marble is an iconic marble from Italy. The stone gets its name from where it originates. 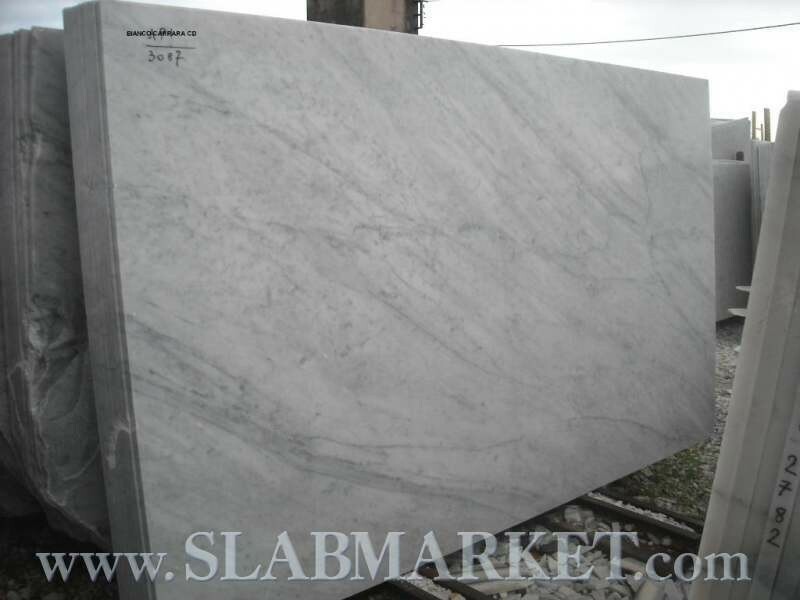 This exquisite white stone is quarried in the city of Carrara, which is located in the northern part of Tuscany, Italy. The elegant white marble contains shades of white and gray with darker gray veins. Carrara marble is used in everything from sculpture to building design for residential and commercial properties. This type of marble is known for its distinctive veiny patterns. Because no two natural stones are alike, each slab may have a variety of different shades from brighter white backgrounds to grayer shades. White Carrara marble tends to have softer veins than other types of marble. In addition to the gray veins, this type of marble can also have a slight gold shade to the veins. Marble is among the softer, more porous types of natural stone. It can be stained or etched by foods and liquids or harmed by cutting foods directly on the countertop. For this reason, it is best to have it installed in lower traffic areas of the home where the finish is less likely to be damaged. 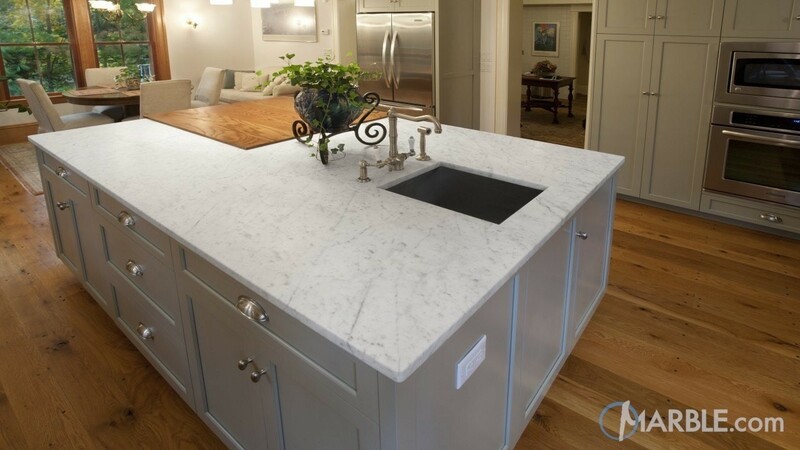 White Carrara marble is an excellent choice for use on a low traffic kitchen island, a butler’s pantry, or baking station in the kitchen. Using marble in the bathroom adds elegance and beauty to the space, but it is best reserved for bathrooms that don’t get heavy use. This type of marble is a great choice for a master bathroom vanity top or bathtub surround. It is really not suitable for kids’ bathrooms because the marble can be easily stained by liquids and spilled toothpaste. White Carrara marble is often used for a fireplace surround. A marble fireplace surround creates a gorgeous focal point in the room and adds a touch of elegance to a living room. The white stone with gray or tan veins is neutral enough to match virtually any color scheme. If you like to change colors in the room often, your fireplace will continue to work with your design changes. You can’t use just any household cleaner on a marble vanity top or kitchen countertops because the harsh chemicals used in many cleaning products can cause damage to this type of stone. It is important to use a cleaner that is specifically formulated for use on marble, such as Mr. Stone’s Daily Countertop Cleaner. This cleaner is easy to use, just spray and wipe to keep your stone looking great without harming it. Your marble vanity top and kitchen countertops will require sealing up to four times per year with a quality sealer, such as Mr. Stone’s Superior Zero Natural Stone Sealer to protect the stone. Mr. Stone’s Superior Zero Natural Stone Sealer is easy to use and provides protection against staining for porous natural stone surfaces, including marble. We at SlabMarket offer slab yard owners the ability to expand their offerings to customers. Join SlabMarket to gain access to exquisite natural stone from quarries around the world. You can browse through the extensive inventory and build a container with the types of stone and stone colors you want. Add a few different varieties of stone to your container to give your customers plenty of options for all types of projects. Many homeowners seek this distinctive and elegant white stone for their home and White Carrara marble is an excellent choice. When used in low traffic areas of the home and given proper care, their new marble fireplace surround, countertop, or vanity top will last for many years. Give your customers the chance to view his slab in full, we guarantee it will be a hit.